The Department of Agriculture and Water Resources has confirmed a ship destined for New Zealand was found carrying brown marmorated stink bugs when it arrived in Australia this month, and has been ordered to anchor offshore. Newsroom reports the vessel is the Armacup Triumph, which departed from Japan and was due to land in Auckland earlier this month. It’s now sitting off the coast of Queensland, carrying cars from China, Japan and Korea, and the department says it’s working with the operator on a treatment plan. · On 17 October 2018, a roll-on roll-off vessel, departed Japan with cargo loaded from China, Korea and Japan. · The vessel was subject to heightened vessel surveillance for BMSB. · On arrival in Australia, the department performed a routine inspection of the vessel where a significant number of exotic stink bugs (including BMSB) were detected. · A small amount of cargo had been discharged before vessel operations ceased. Discharged cargo was directed for onshore treatment with an approved BMSB treatment. · Subsequently, the vessel was directed for thermal py-fogging prior to another inspection conducted by the department. · During the second inspection, both dead and alive stink bugs (BMSB and other exotic stink bugs) were detected. · The vessel was directed to anchor at sea pending a risk management proposal to be provided to the department for consideration and approval. · The department has had ongoing engagement with the shipping line and its operators to progress a suitable risk management plan that addresses the biosecurity risk to Australia. · On 22 November 2018, departmental officers boarded and conducted additional inspection activities of the vessel and its cargo. · Officers collected additional exotic stink bugs (dead and alive), including insects collected by the crew of the vessel prior to the inspection. · A full assessment of all insects recovered from the vessel since its arrival in Australian territory has been completed by specialist departmental officers. · The department has considered these findings along with the risk management plan submitted by the vessel operator. 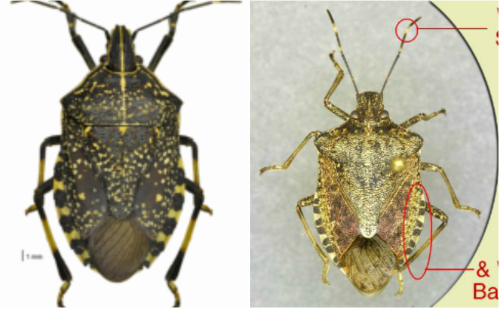 · The continued detections of exotic stink bugs indicates the likelihood of a residual live population on board the vessel that remains undetected. · The department considers that the vessel and its cargo continues to present an unacceptable level of biosecurity risk. · To protect Australia from the risk posed by this vessel and it cargo, the department has directed the vessel to leave Australian territory. · As a result, the cargo on board the vessel has also been directed to be exported from Australian territory.